Vivienne Tam is a master in merging traditional Chinese themes with contemporary techniques. 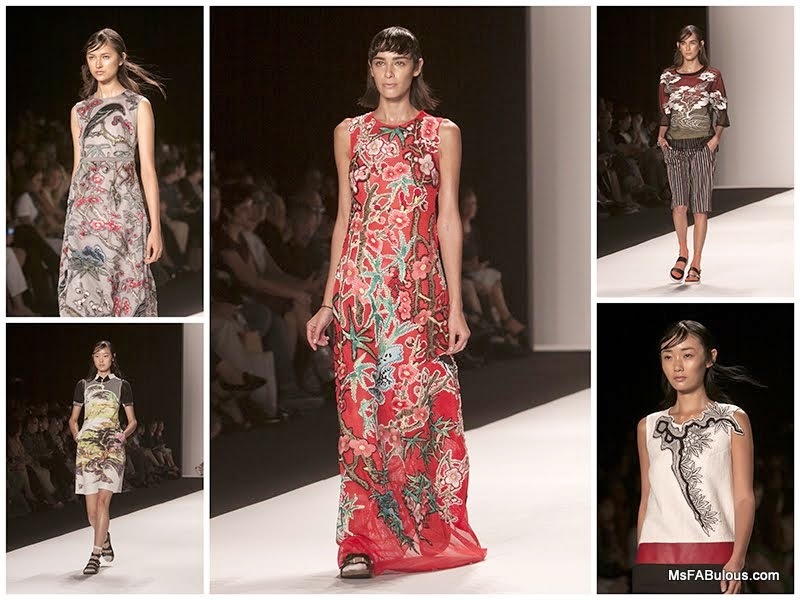 For spring 2015, the designer took her inspiration from China’s Forbidden City. Landscapes and nature patterns like waves and clouds were printed onto blouses or handbags. Birds, flowers and trees were embroidered onto athletic fabrics like power mesh. Printed neoprene was cut and appliqued onto other fabrics in a sports meets high fashion mix. These motifs are found in historical artwork and handicrafts in China and treasures from inside the Forbidden City. Her color palette was similar to her collections of the past. She used her signature red, black and ivory. There was a pretty ceramic blue and bits of citrus yellow and purple in prints. The big trend in many collections this season is wearable tech. Vivienne Tam offered handbags that charged your phone when you put it inside. 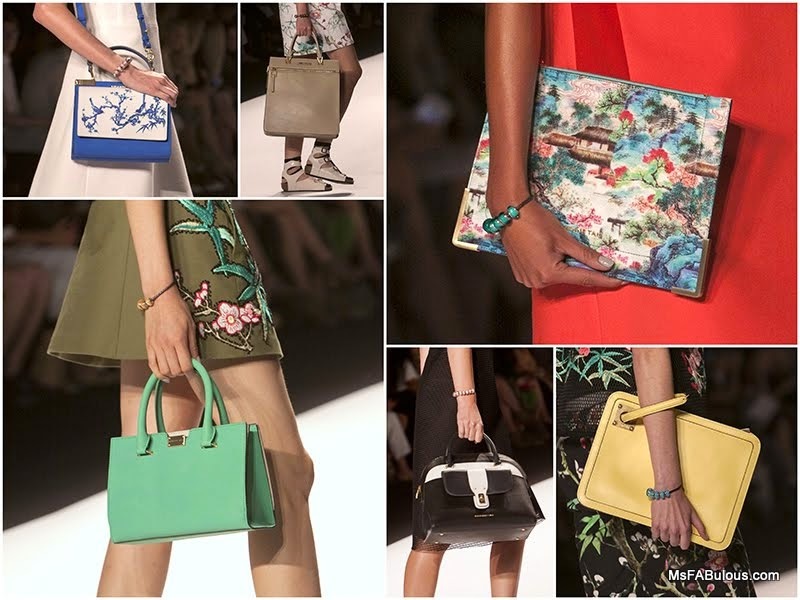 Unlike many of the clunky pieces that many tech companies produced, the accessories on this runway were so stylish, I would be happy to buy them on design alone with the functionality being a big bonus. The most popular jewelry was a variation on the knotted beaded friendship bracelet. Unfortunately, my least favorite part of the catwalk was the footwear. Normally, I would be enthusiastic about seeing a designer promote practical, comfortable footwear, but the socks and flat sandals the models wore looked like a bad tourist cliché. Paired with the sleek, beautifully rendered pieces on the body above, it just did not make sense. Was this a nod to the casual attire of Silicon Valley? 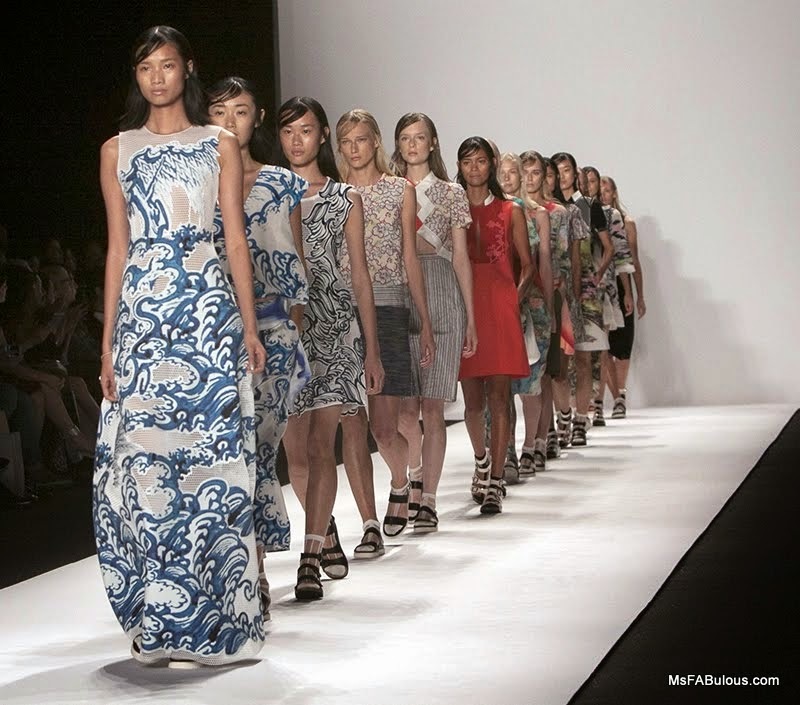 Sure, wearing comfy shoes should be a goal in real life, but on the New York Fashion Week runway, I realized I would prefer to see some nice heels on the models that are only spending 90 seconds in them. Even the most professional of models, wearing socks and flat, duck-like sandals affects how they walk and the overall impression on the runway. With Vivienne Tam’s tongue-in-cheek design process, I think the models were lucky their feet were not bound instead.